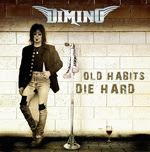 RockUnitedReviews: DIMINO: "Old Habits Die Hard"
Frank Dimino, originally known as the lead singer of Sweet Mana from Heaven, Angel were later discovered by KISS bassist Gene $immons who secured them a deal with Casablanca Records in 1975. I can't say that I've enjoyed the ANGEL music of the past and I still haven't heard all of their albums. But one thing's for sure. This does not sound like Angel music and you won't find any pomp. Basic meat and potato rock in the 70s style meet second rate Saxon material of the early/mid 80's. Dimino has co-written four tracks with Stryper guitarist Oz Fox and the opening two are their work. First up, the song and dance number of 'Never Again' (Oz Fox/Dimino). The refrain is beyond silly as they keep repeating the words 'Never Again' eight (8) times. Listening to this and you're soon bound to agree with the title. Never again indeed. 'Rockin' In The City' (Fox/Dimino) goes through several stages of eighties metal and rock where the Hammond organ is the only thing that may differ from your average Saxon tune. Not too shabby though and Dimino might just even sound like Biff Byford here. Mid-eighties Saxon featuring organ? Yeah. Pretty close to core actually. "I Can't Stop Loving You", Saxon meet Heavy Pettin? "The Rain's About To Fall", dull and boring rock. "Even Now", the fine semi-ballad and also the proof that Diminio is still in nice vocal form. Guest musicians include well known names such as Paul Crook (Meat Loaf), Eddie Ojeda (Twisted Sister), Rickey Medlocke (Blackfoot), Punky Meadows (Angel), Pat Thrall, etc. Decent/bland effort from the former Angel.